Jackie had her baby! It's a girl! 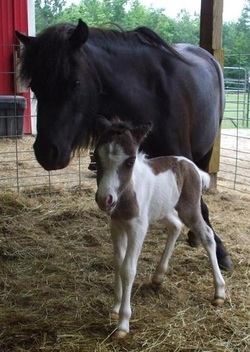 Lila was born the morning of May 24 and stood 19 inches tall. Her sire is BJ who can be seen on the Reference Stallion's page. Although we have had other foals born on our farm, Lila is the first foal resulting from breeding our mare to our stallion. For that reason she's a little special to us and we've decided to keep her here on our farm. She can now be seen on the Mares & Fillies page, and there are lots of pictures on Lila's page too.